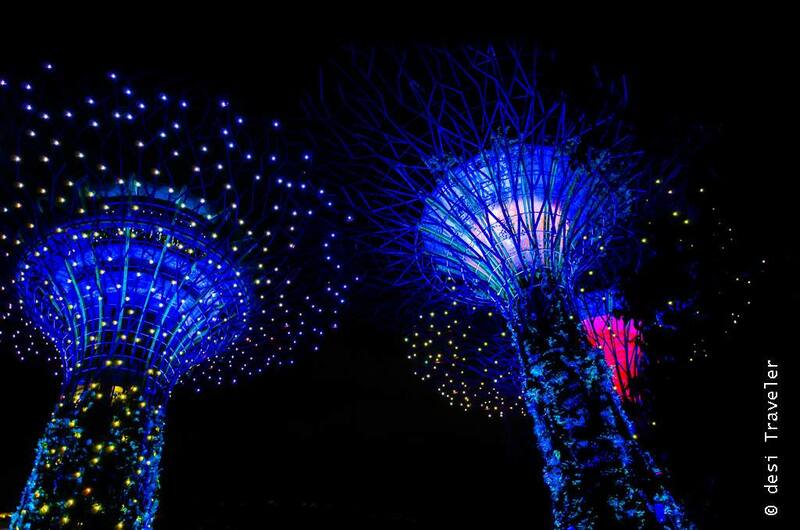 Singapore has many surprises and it takes more than a visit to discover some of them. But even in a fast paced city like Singapore, the best way to discover things is to let them unfold to you slowly. While I am all for reading guidebooks and travel blogs before visiting a place, I also love discovering a new aspect of the city, that no matter how popular is something new to me. 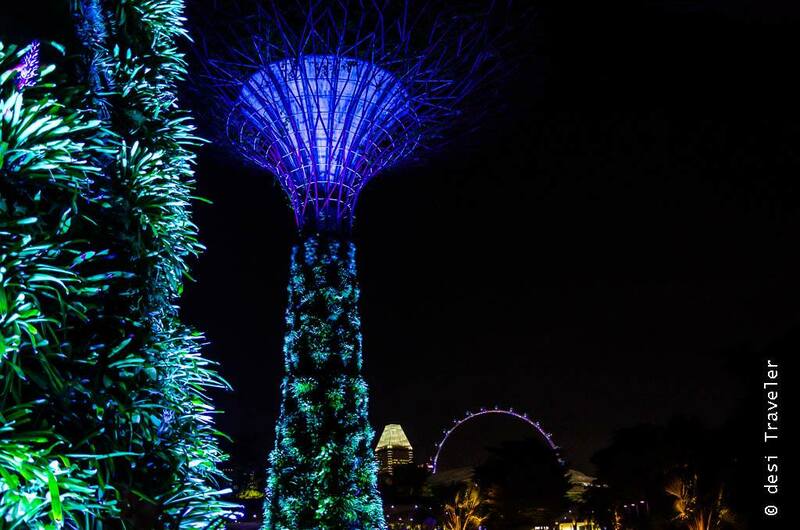 The Supertree Show at Gardens By The Bay is one such dazzling wonder that I was not aware of even though I have spent half a day at Gardens by the Bay in my first visit to Singapore. It will not be wrong to say that all true great cities in the world show their true charms only after dark. As the sun goes down these wonderful cities rather than going hurrying back to the safety of homes actually come out in hordes to make the most of the collective and personal safety they offer to both the visitor and locals alike. 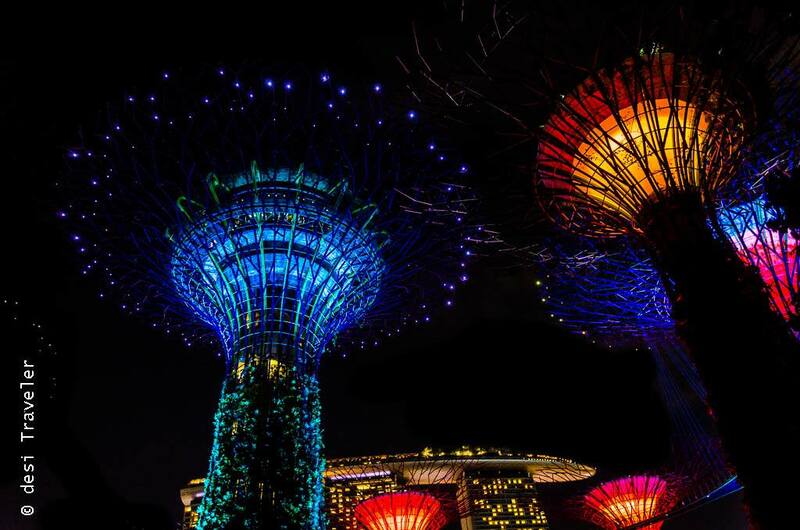 Singapore is no exception and in my opinion one of the best places for a family holiday. 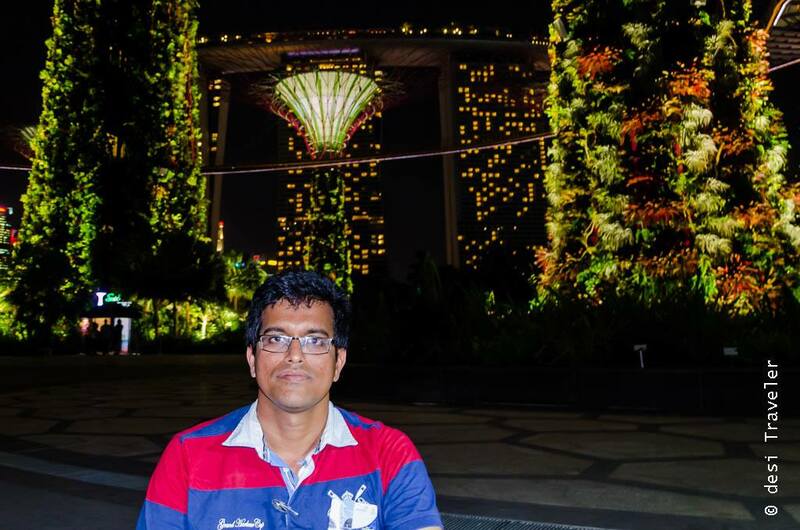 As I was getting down from my air-conditioned bus that we took from Changi Airport to downtown Singapore, the mellowed down sea breeze caressed my face, and invited me to experience Singapore in Night. 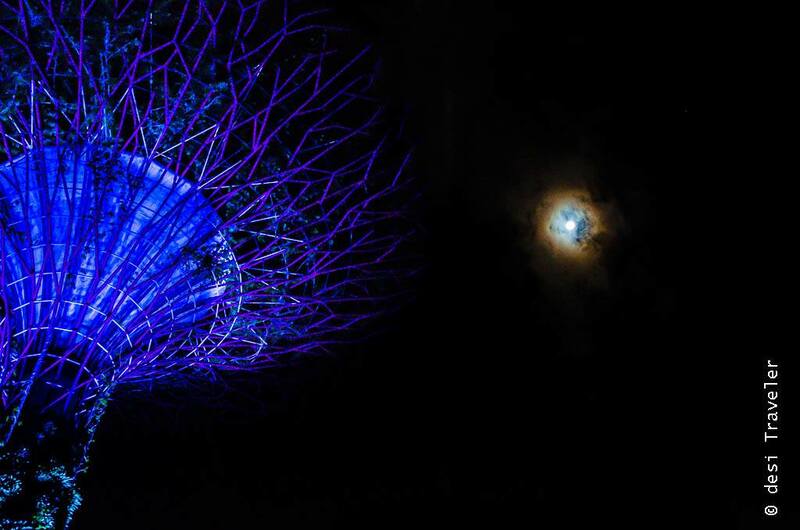 The night view of the Supertree grove is totally different from what you experience during the day. 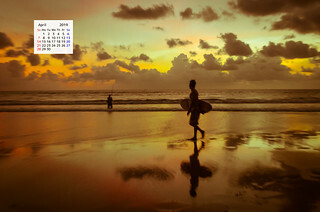 The first difference you notice is the temperature, as Singapore is only 142 KM from the Equator the days are always hot and humid, but thanks to the sea all around the island evenings are pleasant. As we moved towards the Supertree Grove we saw hundreds of people both locals as well as tourists all around us waiting for the Supertree show to begin. 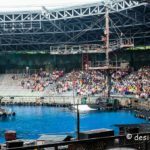 As there is no specific seating area, you are free to sit on the ground, lean back against small platforms, park benches etc. a true desi kind of place in the super organized Singapore. As I had not done any research on the Supertree Show officially called the GARDEN RHAPSODY- GARDEN WALTZ in the Singapore Tourism website and broachers, I was waiting for some action to begin while I was playing around with my camera. Like almost all things in Singapore the show started at dot 7:45 pm Singapore time and only then I realized what all the anticipation of hundreds of people around us was all about. 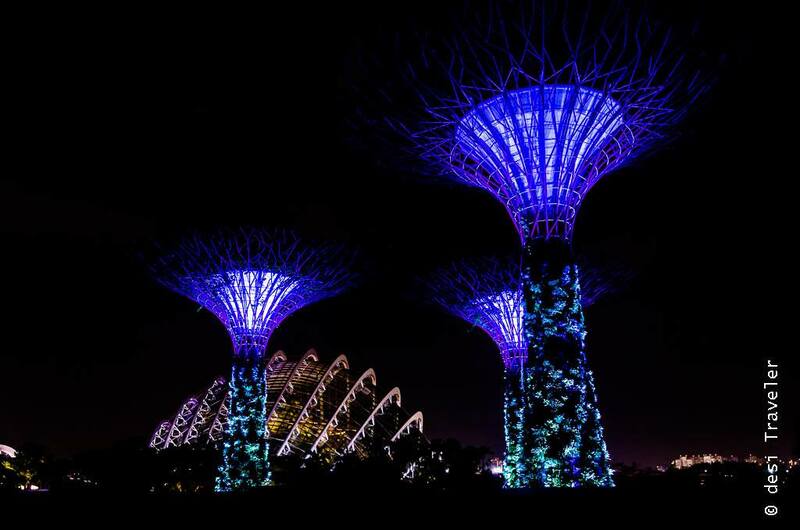 The Supertree Grove look straight from a science fiction movie more like an Avatar or some episode of Star Wars rather than a structure on earth. Each Supertree though looks similar is actually a quite unique structure formed with a central concrete core, surrounded by a layer of pots with more than 200 species of plants ranging from bromeliads to ferns & everything in between. 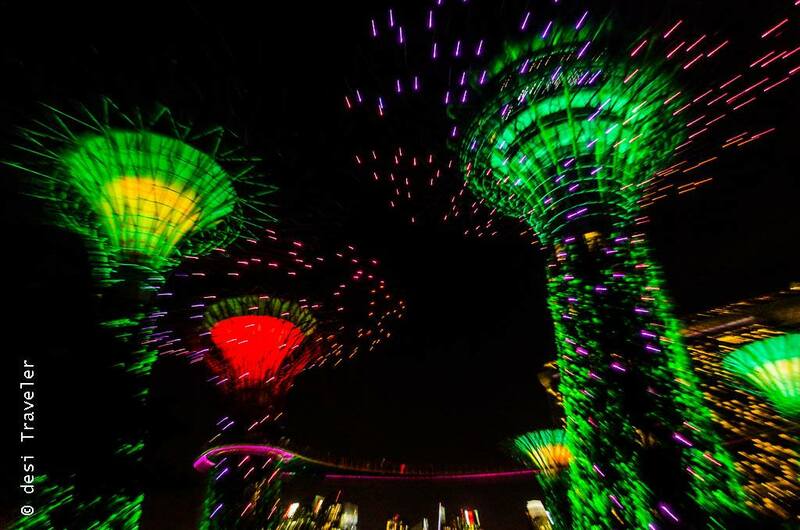 The plants act like a living breathing skin around the Supertree and give them an individual character. The top of each Supertree is different while some have structures to harness solar energy others form a web of a skywalk that takes you around the complex. One of the largest Supertree also has a restaurant on the top level simply called SUPERTREE DINING that serves local and international cuisine. 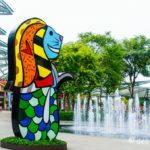 Most of the downtown Singapore attractions are close to Gardens By the Bay and you can see the Singapore Flyer, the Marina Bay Sands Hotel, etc. in the background. 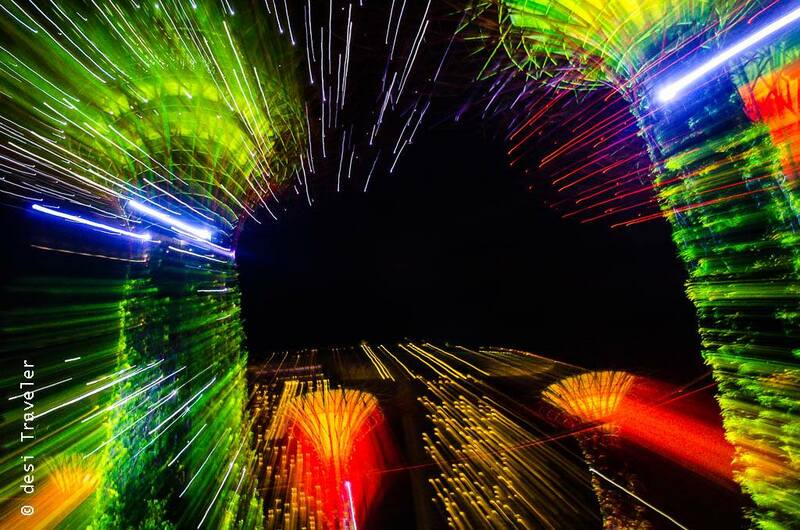 Once the sound and light Supertree Show begin you start feeling the magic of the night. Each tree that till now was looking like a Ghost in the darkness starts changing colors like a lovelorn chameleon waltzing to the pace of the music, that echoes the heart beats of a torn heart that long to unite with a love lost. With the trees showering you with scintillating colors traveling at the speed of light, you feel that you are living a dream surrounded by fireworks of Diwali minus any pollution and the deafening sound of crackers. Instead, what accompanied the dance of the light around us is a musical that recreates the magic of opera around you. As the music takes our senses, the feet tap to the rhythm, but I force myself out of my music-induced haze and pick up my camera. The intensity of light and colors around me change to the rhythm of the music that floats around like a butterfly, about to settle on a nectar filled flower, but then changing mind at last minute and flutter the wings again taking the tempo to a higher pitch. Music is the fuel, and the only drug you can get legally in Singapore and the GARDEN RHAPSODY- GARDEN WALTZ sound and music show at Gardens by the Bay has a fountain of this elixir every evening for all to quench their thirst. As I am clicking the pictures a crazy idea comes to my mind I decided to experiment with the pictures I am clicking of the scintillating Supertree Grove around me and change the settings of my camera. As I mentioned, I felt I was in a fireworks show in Singapore on Diwali night minus the obnoxious sounds and pollution that accompanies the fireworks. 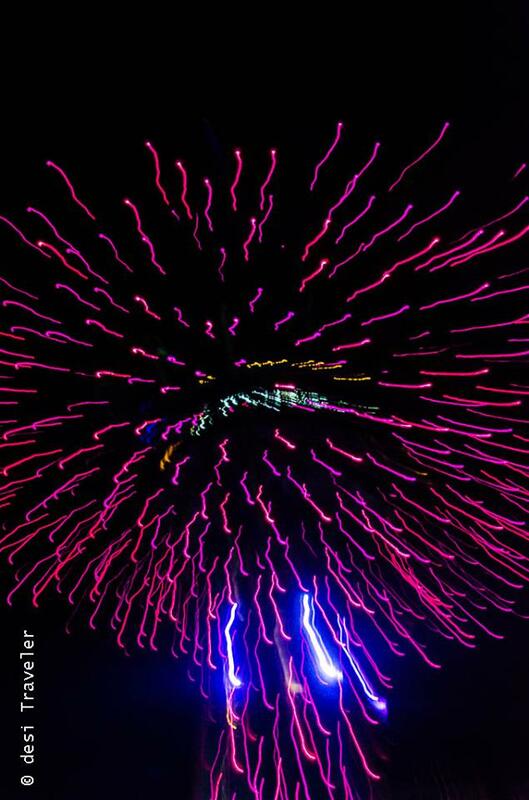 So I decided to click a few pictures trying to recreate the fireworks effect in the pictures. 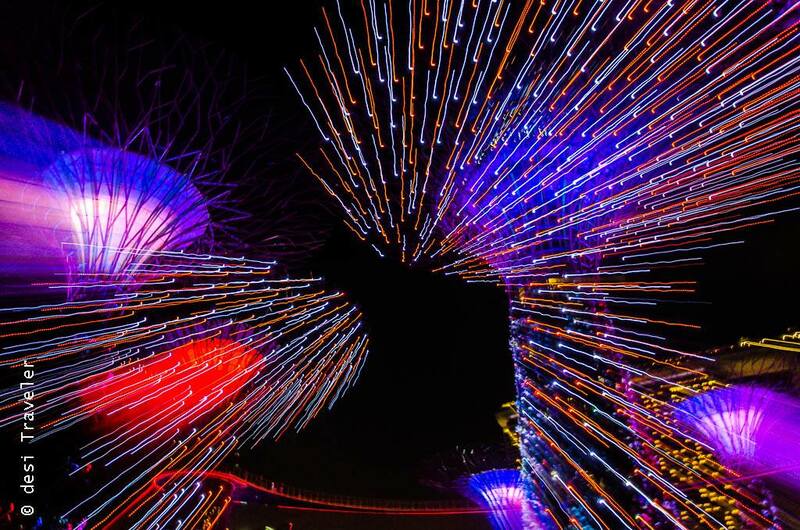 Here are a few pictures that showcase the firework effect in the pictures that I clicked at the fireworks show Sound and Light Show at the Supertree Grove at Gardens By The Bay in Singapore. 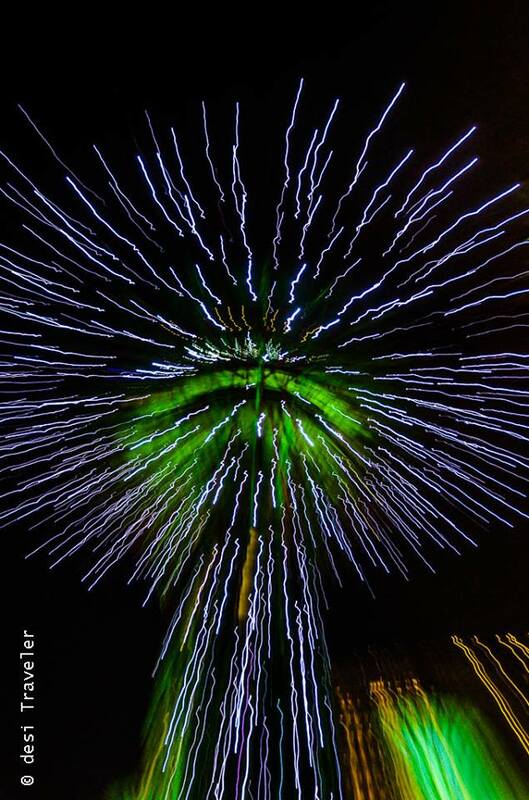 The special photography technique used in these faux fireworks pictures is called Zoom Burst Effect. Changing the focal length at which you shoot, as you press the shutter button. But as I was not in an ideal world I clicked the pictures without using a tripod, but trust me results with a tripod will be far superior to what I got. Note down the settings the camera gives you. 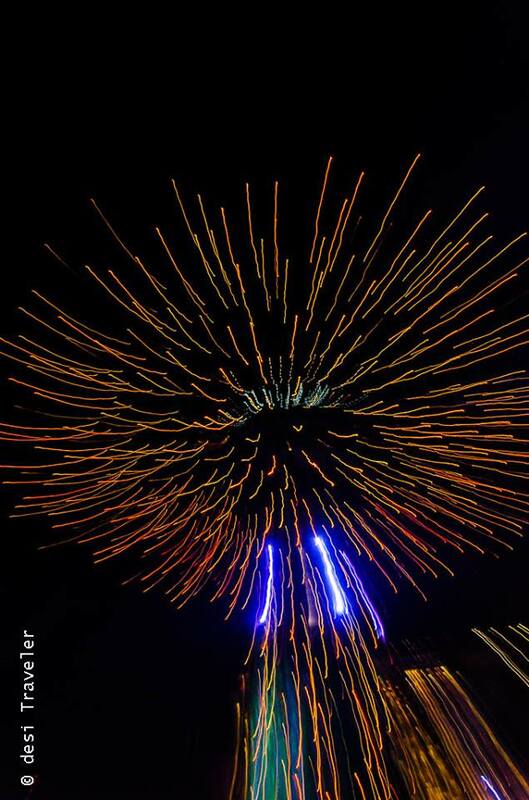 Switch the camera to fully manual mode and adjust the settings so that you get a decent exposure and long shutter speed. The settings you got in auto mode should give you some idea of the settings to be used, but you will need to adjust as per the light available and the effect you want to bring. Focus and click. You will get a normal picture with this method. Now for Zoom burst, you need to make a simple change in your setting. Once you are pressing the shutter button simultaneously move your zoom ring to zoom closer to the subject ( or vice versa if you are already zoomed out max ). What we mean by this is that you rotate the zoom ring manually as you press the shutter button. 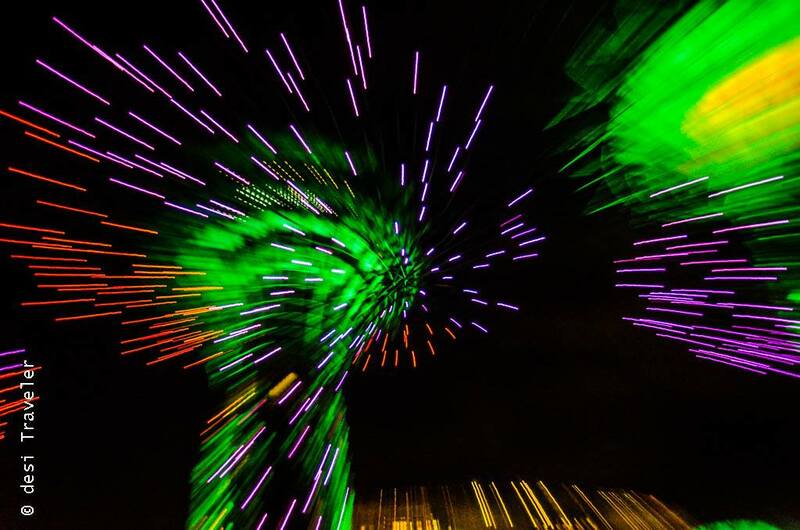 This changes the focal length of the lens during the clicking and creates a motion kind of effect, leading to a fireworks kind of image of the lights I was trying to click. 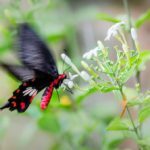 Make sure your hands are extremely steady when you press the shutter and zoom in/out the lens, if not you will get motion blur. As I did not use a tripod you can see the shots are not very sharp. 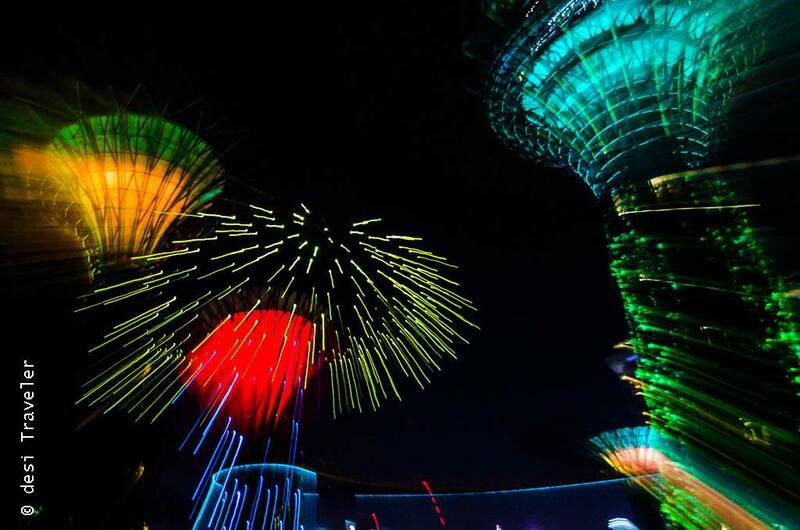 But my aim was not to get sharp shots but the zoom burst effect that led to the creation of fireworks in sky kind of effect at the Supertree Grove. Flower ? Fireworks ? You decide…. 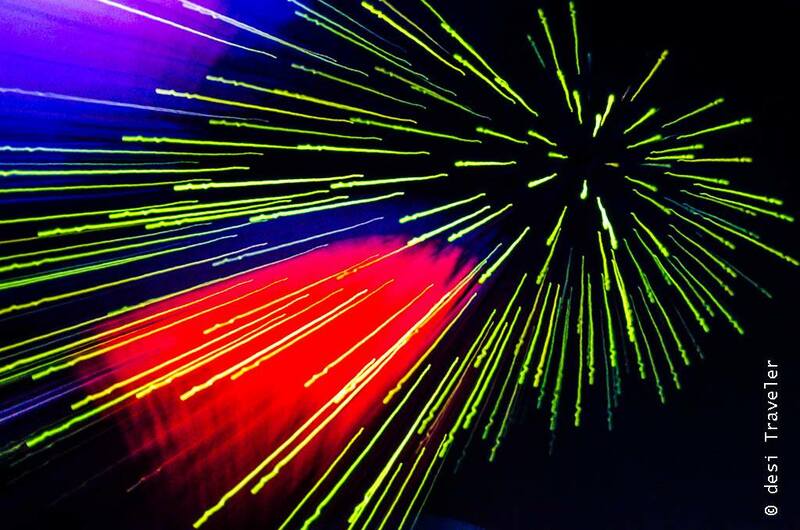 Shutter speed: Varied between 1/8 to 1/25th of a second. If you have a tripd you can experiment much more. Focal length: 18 mm in normal shots and it fluctuated between 18 mm to 105 mm as I zoomed in. 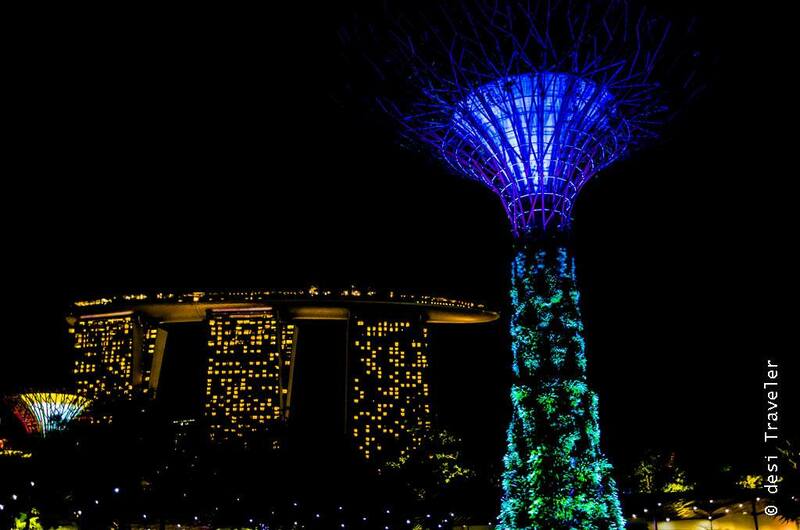 Where is Supertree Show in Singapore? 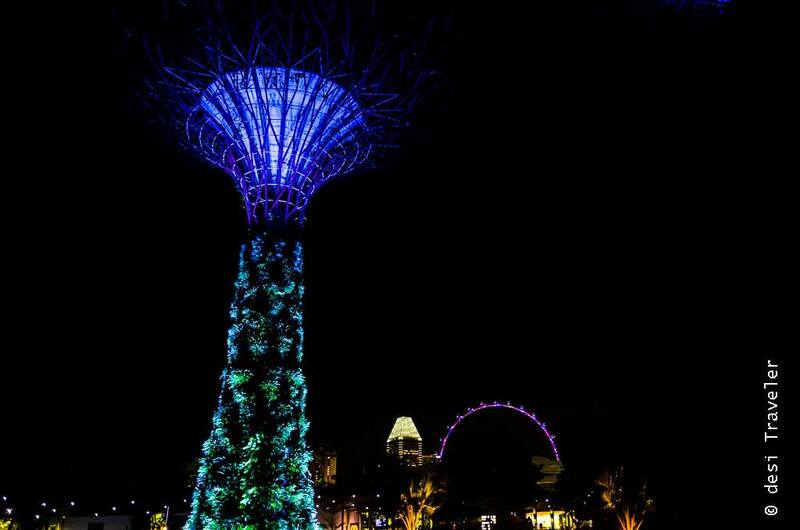 It happens at the Gardens by Bay everyday in evening. The show is absolutely free, YAY, thanks to Singapore Government for both locals as well as tourists. However please note there are tickets for entering the Flower Dome and the Skywalk, check the official site for details. 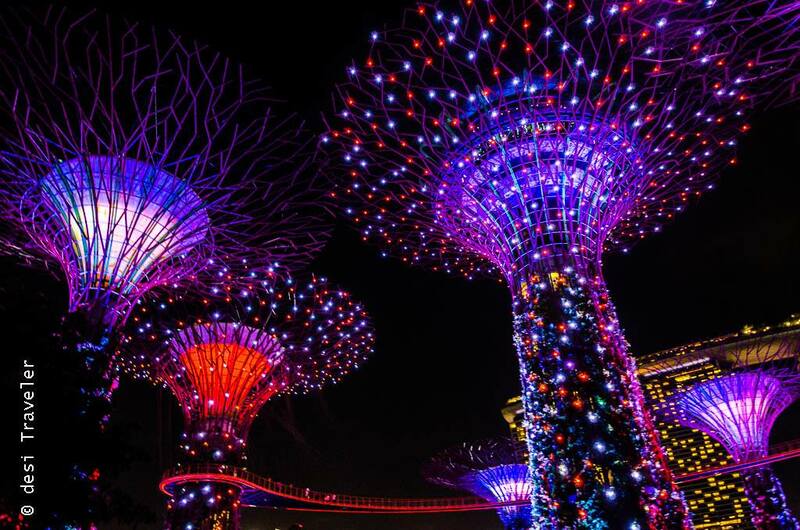 The Supertree grove opens from 5 am to 2 am, but the sound and light Supertree Show is in the evening at 7:45 pm Singapore Time and 8:45 pm Singapore time. Each show is 15 minutes. desi Traveler tip: Reach a bit early as this is a very popular show and the best slots fill fast. Nearest Singapore Metro Station: Bayfront. 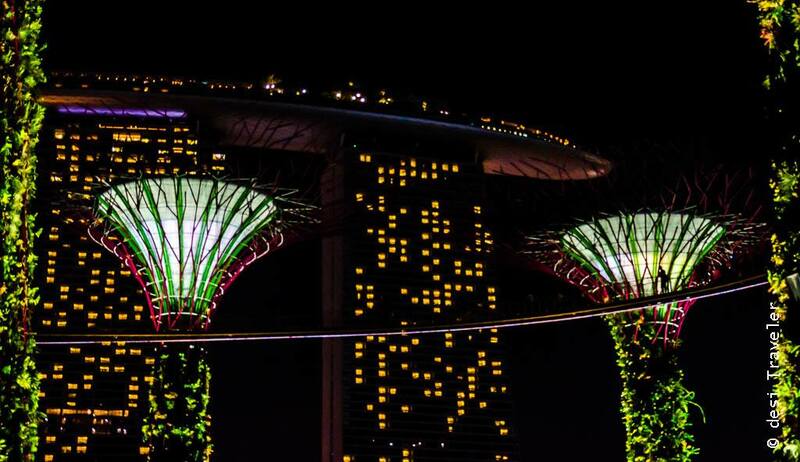 Follow this Google Map to Walk from Bayfront to Supertree Show at Gardens By The Bay. 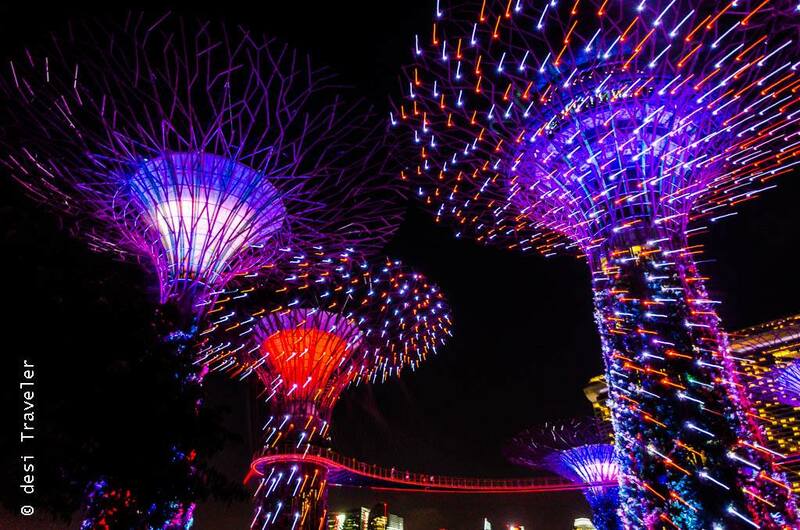 If you are in Singapore and want to enjoy a dazzling Supertree Show that is absolutely free then you must visit Gardens By The Bay in the evening and enjoy one of the most scintillating sound and light show. 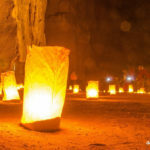 Wow pictures of Zoomburst photography..
my parents have been raving about this place for ages but their photo’s don’t do it justice – yours however…. amazing. And I read your photography tips with interest, thanks. Those are really amazing pictures! This is super awesome post! Night photography always gives me jitters. Mostly I don’t have a tripod or it’s too windy and so on..
One can do a lot more with the help of a tripod as the exposure can technically be to any amount of time one wishes..but normally with a tripod, I go for up to 30-second exposure, compared to only up to 1/8th of a second in these images. You have captures some extraordinary pictures. 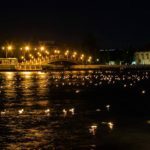 You have so steady hands, as you say you clicked those amazing pictures without a tripod… Hats off… And thanks again for the tips which you always provide to help others (Myself included 🙂 ). I am definitely going to try this. Also when I had gone there there were tickets for the skywalk, have they made that free as well ? All the best Ruby. 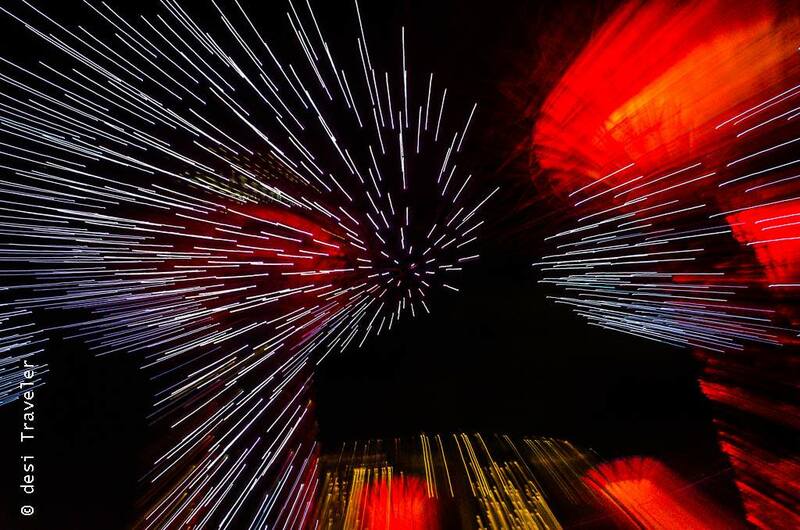 You are right only the Sound and Light Show is free, if you want to enter the Skywalk or the Flower domes you need to buy tickets..